You could just toast the bread but I like to make it a little more special by pan toasting in a little butter and olive oil. Drizzle a little olive oil into a pan along with a good knob of butter and place on a low heat. When the butter has melted, tumble in the sliced onions and cook ever so slowly until meltingly soft and just starting to colour. For the best result, this should take about 20 to 30 minutes. Increase the heat, add another knob of butter - when it has melted and the onion has started to colour, add in the sliced liver. Cook each side of the liver for about 30 seconds or until browned - it's important not to overcook the liver or it will be tough. When it has browned on both sides, deglaze the pan with a little white wine and season with sea salt and white pepper. Remove from the heat and sprinkle over with chopped parsley - give it a stir and serve. 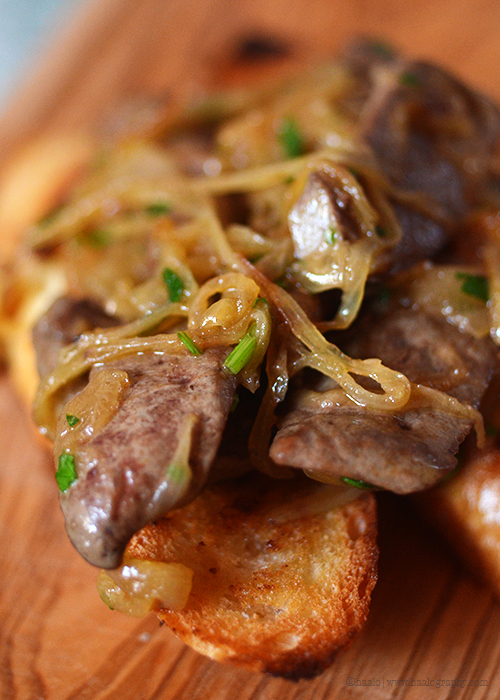 Place the crostini on a plate and then top generously with the liver. Eat at once!